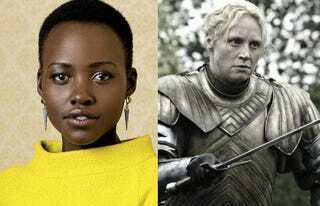 Apparently it's totally amazing Star Wars news day, it's just been officially announced that Star Wars: Episode VII has cast the brilliant actress Lupita Nyong'o from 12 Years a Slave, and our beloved Brienne of Tarth from Game of Thrones, Gwendoline Christie. Hooray! Star Wars.com just officially announced that two of our very favorite actresses would be joining the already stellar cast for Episode VII. This also allows me to post this amazing bit of art of Lupita Nyongo as Asajj Ventress (by Nikkolas Smith). Great news!